Formal Dining Room to Office: If you only use the dining room for special occasions/holidays, you're not making the most of this space. 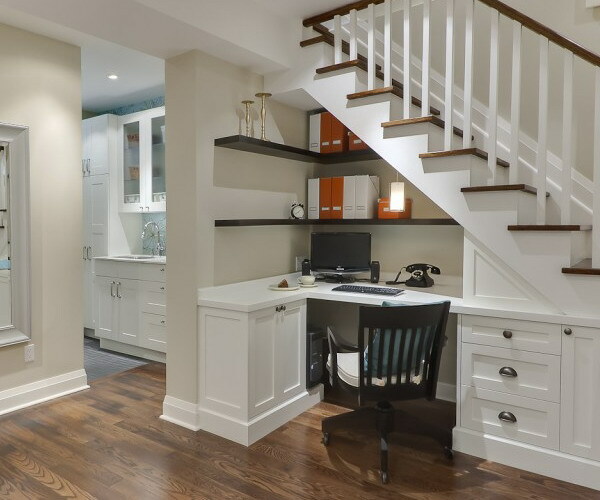 This would be an ideal spot for a home office and one central place to house all of your office supplies, files, paperwork, etc. Bring in a desk, seating and lighting and you have the perfect room to suit all of your work and study needs. Small Bedroom to Closet: If you have a bedroom that is too tiny to really be used for guests, turn it into a fantastic walk-in closet. Hire a closet organizing company or install shelving, drawers, rods and shoe racks yourself to create your dream closet. If the room shares a wall with the master, open up the wall between and insert closet doors. Formal Living Room to Library: Books take up a ton of space and can make rooms look cluttered, a formal living room that is not being used will make the perfect home for all your reading materials. Line the room with bookshelves, bring in some comfortable seating and make sure there is plenty of light to read. Under-Stairs Space to Storage: Maybe you don't have an entire room that is not useful, but what about that space under the stairs? Everyone can always use more storage! Create your own custom built-in storage cabinets or cubbies to fit the space. This could also make a great area for a built-in desk. Check out some great design ideas on Houzz. Say goodbye to wasted space and hello to functional square footage!